Our on-site facial filler & injectable expert is James Christian Sardelli, a Registered Physician Assistant - Certified (RPA-C). 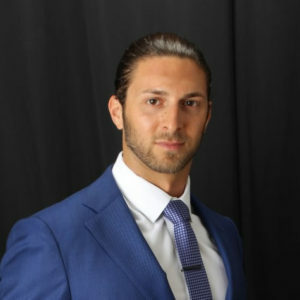 He is the owner and operator of James Christian Cosmetics, our high-end BOTOX® and Facial Filler clinics located across New York City and Long Island. His experience, skill, and artistry performing dozens of BOTOX® and dermal filler procedures each week bring an unmatched level of expertise to the injectable services performed at all of our locations. Our injectables are designed to offer our patients a non-invasive, non-surgical method of improving the appearance of facial wrinkles, lines and creases due to aging and sun damage. Born and raised in the suburbs of Long Island NY, James Christian has a well versed education and training in the medical field from the south to north shore and spanning Manhattan, Queens and Brooklyn. He began his studies at Florida Atlantic University in Boca Raton, Florida; and then completed his graduate studies in allied Health Sciences at Touro College receiving a degree and medical license as a physician assistant. He has trained under some of the top plastic surgeons of the metropolitan area. James Christian’s practice began nestled on the gold coast of Long Island and has expanded greatly with the advancements in injectable and laser technology. He provides expert technique in all injectable fillers and muscle relaxants over the past decade and continues to make strides as modern medicine evolves. James Christian has over ten years of experience as an expert injector. His advanced training certifications has put him atop the leaders in anti-aging injectable procedures. With his continuing education in the technological advancements in Aesthetics, James Christian is always on the cutting edge. With his finger on the pulse, you will always have access to breakthrough anti-aging medicine. Introduced in 2002, BOTOX® Cosmetic is the first botulinum toxin to be approved by the FDA to temporarily treat moderate to severe frown lines between the brows. It is designed for use in adults between 18 and 65 years of age for a short (temporary) period of time. It must be administered by a healthcare professional. This neuro-toxin paralyzes the muscles by preventing the release of a chemical in the muscles called acetylcholine, effectively blocking the nerve impulses to the injected muscles from causing moderate to severe lines to form on the face. Once this chemical has been blocked, the muscles are effectively unable to move. Out of approximately 11.8 million BOTOX® Cosmetic procedures that have been administered in the United States since 2002, the majority of patients surveyed were satisfied with the results of their experience. the areas around the eyes to lessen the appearance of "crow's feet"
the area around the mouth (perioral muscles) to lessen "smile lines"
No matter your aesthetic goals for a more youthful appearance, we can give you a complete treatment plan that addresses each of your facial concerns. During the treatment, we ask you to frown, furrow your eyebrows and smile to see which specific muscle groups need to be targeted in order to give you a smooth face that does not show wrinkles in the places that bother you. We are known for sitting with patients for as long as needed to answer questions and customize a treatment plan that will be most effective while working within your budget. The passion of beauty enhancement is the cornerstone of James Christian’s practice. He looks at a patient’s natural beauty and enhances it at a steady methodical pace, striving for perfection as well as a pain free procedure. His subtle technique, accompanied by a light touch of the hand, gives patients the relaxed state of mind before any procedure. His bedside manner creates a comforting experience from the moment your dialogue begins. His keen eye and attention to detail allow patients to enjoy natural-looking results. He prides himself on safety and superior results with every injection. You will notice that directly after the injections, the treated areas may be tender and slightly red. These are normal reactions that the body has to both the BOTOX® solution as well as from the needle. More serious side effects are extremely rare but can include allergic reactions, skin rashes, dizziness or trouble breathing. We will provide you with that information prior to your treatment. Because the body gradually removes the neuro-toxin from the muscle tissues over time returning complete movement to the treated muscles BOTOX® Cosmetic is designed to be re-injected about every 3 to 4 months. Once you begin treatment our office automatically reminds you when it is time or your next treatment. BOTOX® costs are based upon a per unit fee. Depending upon the size of the area to be treated, a half dozen or more units may be used per area. When multiple facial areas are treated, the price increases appropriately. Though the prices of BOTOX® can go up or down based upon supply/demand and competition between providers, we offer competitive prices as well as seasonal specials running throughout the year so that our injectables patients receive the best treatments at the most affordable prices. Some very scary stories in the news lately include those about people who have, for the sake of saving money, received "Botox" treatments from an unqualified person and ended up with terrible and sometimes lethal consequences. Don't ever take chances with your health; make an appointment with our injectables expert James Christian instead! Anti-aging and aesthetic enhancements have never been more enjoyable with James Christian at the helm! His calm demeanor and caring bedside manner has built a large base of fans who simply won’t go to anyone else. We are glad to work with our patients to reach an affordable treatment cost, especially when they commit to a long term treatment plan for 12 months or longer.